Wyo Pete appears to have been a literary persona created by Bob Peterson of Maybell, Colorado, referring to himself. Some references to Wyo Pete are in the third person, while other writings are in first person. Biographical statement, presumed to have been written by Bob Peterson. [Bob Peterson was born on the Western Nebraska and Wyoming line, north of Cheyenne, Wyoming. He lived on a ranch with his Mother and father until he was seventeen. Always like[d] to draw and paint pictures of the West, and was interested in the history of the West. He and his father broke work horses in the winter time for spending money, that they bought from the neighbors as go bad saddle horses. He was potty trained while herding sheep with his mother horseback on the prairie after the depression of the thirties took the cattle. He graduated from high school without any art training, but received scholastic honors in Art as an untrained artist. Left home and became a professional horse trainer. He built a successful business and got married in 1971. He sold out because of numerous injuries, and returned home to Wyoming to recuperate and put together and establish the combination of the largest ranch in the county. After three bank failures and the final Farm Credit inadequacy he retreated to Laramie with the [remainder] of his cattle herd. On the mountains in the last remaining days of his cattle operation with his children beside him riding the mountain meadows Wyo Pete was born. All his years of ranching, housebreaking, painting, and life in general finally came to a peak at Laramie Peak. This is how his cowboy poetry, and art really came into being.] 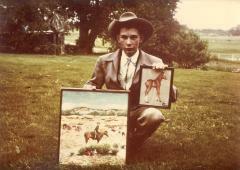 Collection includes correspondence, including a letter from Buck Ramsey to Hal Cannon, introducing the work of Wyo Pete; a typed biographical sketch; typewritten poems; a staple bound booklet of poetry and sketches; loose photocopies of sketches and poetry; and color photo prints of art works and persons, presumed to be Wyo Pete.